You are purchasing a full set of 4 (2 front & 2 rear) offical Pi lowering springs for your NISSAN PRIMERA P11 08/1999>2002 2.0 CVT designed to lower the ride height by F25/R15mm. Uprated and improved PI Sportpack Suspension Systems offer the best in balance, performance, quality and price. No matter what you drive, your vehicles development engineers were faced with considerations that ultimately affected its performance bumper heights, wheel arch clearance and the number of people the vehicle was designed to carry. To accommodate all of those variables, your cars suspension had to be tuned for average conditions, acceleration, braking and cornering. You need to tune your vehicle to better match your driving style. Safer high speed chassis control. All kits are specifically designed to fit your car as a direct replacement for original parts without alteration. Our sportpacks can be fitted by any normal garage or experienced mechanic in the same way as orginal parts. Just swap the parts over and enjoy the ride. Please feel free to ask us any questions or queries that you may have, we are only too happy to help! Here at Verus Suspension we believe in offering only the highest quality products to our customers which is why we are now proud to state that we are an official Pi retailer, Of course you would have heard of the name Pi but maybe you do not know too much about them.... Well here is some blurb and history behind one of the UK's most successful and long serving suspension brands. Personal Identity have been in business for over a quarter of a century, making us one of the longest established automotive aftermarket companies in the UK. Initially specializing in the supply & installation of aftermarket products including body kits, alloy wheels, suspension upgrades and in-car entertainment to the franchised dealer network, automotive trade and general public our reputation soon grew as one of the few companies able offer a one-stop solution to transform and upgrade both the appearance & functionality of the customer's car - indeed to give it its own "personal identity". In 1990 we formed an alliance with one of the world's leading lowered sports spring manufacturers and after extensive market research our Lowered Sports Spring range was introduced - the first of our products to carry the "Pi" brand name. Right from the start we realized the importance of developing a robust distribution network enabling our products to reach the largest possible market and therefore concentrated on offering our customers the best combination of price, quality & availability available in the industry aims that we work hard to meet to this day. 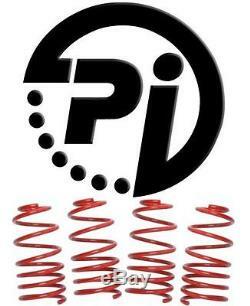 The item "NISSAN PRIMERA P11 08/99-02 2.0 CVT F25/R15mm PI LOWERING SPRINGS" is in sale since Wednesday, October 29, 2014. This item is in the category "Vehicle Parts & Accessories\Car Tuning & Styling\Performance Suspension\Lowering Springs & Kits". The seller is "performance_suspension_uk" and is located in Uk. This item can be shipped worldwide.